Baked cheese empanadas are a healthier altenative to the traditional fried cheese empanadas known as empanadas de viento. I love empanadas and whiel there are so many different types of empanada fillings, and I have yet to try one that I didn’t like, my favorite is the most basic filling: cheese and onion. 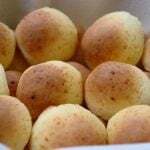 It is easiest and quickest filling to make, and if you are using the store bought empanada discs (for baking) the whole process is very quick and produces a great appetizer or breakfast. These savory cheese empanadas contrast well with the sugar on top of the empanadas and this is something characteristically Ecuadorian. 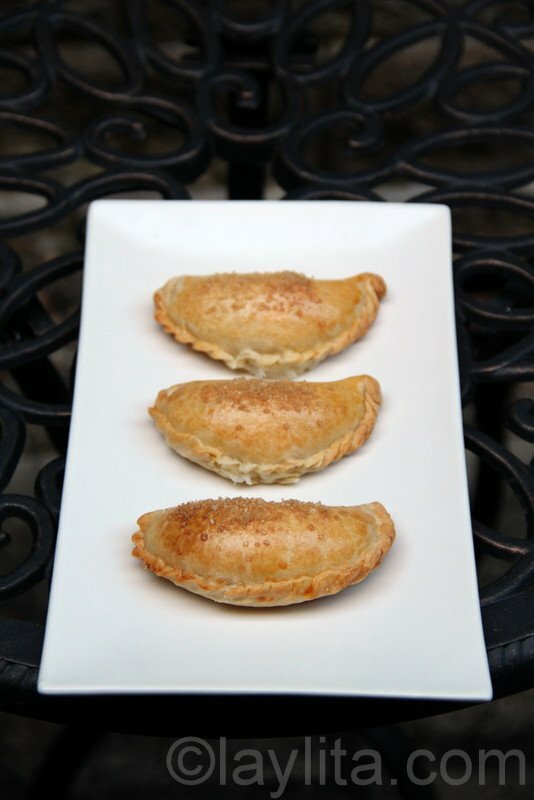 We sprinkle sugar on the top of cheese empanadas, both baked and fried versions. This is something that my boys love, if there’s a choice of different empanadas on the table, they will choose the ones with sugar on top. Mix the cheese and onion together. To assemble the empanadas spoon the cheese and onion mixture on the center of the empanada discs. Brush the edges of the empanada discs with the egg whites (this is will help them seal better and keep the filling from leaking while baking) . Lightly brush the top of the empanadas with the egg yolk, this will give a nice golden glow when they bake. Pre-heat the oven to 400 F and bake for 20-25 minutes or until golden. The challenge with empanadas, especially cheese empanadas, is to keep them from leaking when they are baking. A good way to keep them from leaking is to use egg whites to help seal the empanadas, and it also helps to let them rest in the refrigerator for at least 30 minutes before baking. Despite this I always have at least one empanada that leaks every time, it must be because I overstuff the empanadas, I just can’t resist the idea of having as much gooey cheese as possible. I want to make these for guests tomorrow. I only have brown onion, is that ok? Or should I make a trip to the store? Also, I wonder if I should sauté the onion first. Is this a bad idea? Is it best to put them in raw? Any type of onions will work. I’ve also made empanadas using caramelized onions and it’s really good – especially when using cheeses like goat cheese or brie. For these either sauteed or raw will work, the raw ones will cook, but will be a little bit crunchier. Thank you for this wonderful recipe! I made the dough, and added more water than your recipe called for. Otherwise I followed all your directions exactly, and they turned out beautifully, with hardly any leaks at all. I took them to a gathering of friends who have been to Ecuador, as I have, and they all agreed they were very authentic and delicious! Laylita, no encuentro demerara sugar crees que se pueda substituir con brown sugar? o es mas conveniente simplemente omitir el azúcar. Si, puedes usar cualquier otro tipo de azucar, mientras mas gruesa mejor. O tambien lo puedes omitir y espolvorear un poco de azucar luegos de hornearlas. I have made these quite a few times already and they have always been a huge hit. My nephew fell in love with them and now he asks for them all the time!!! They are so delish. Now I have to make some this weekend. Laylita por cebolla Blanca te refineries a la perla o a la larga? Para estas empanadas puede ser cualquiera de las dos, si tengo la larga la uso y sino la perla. 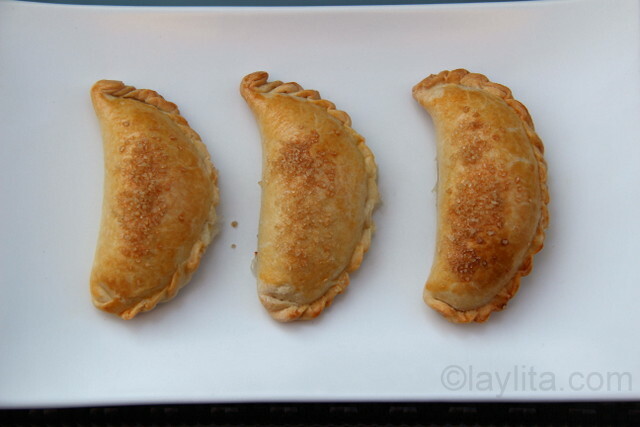 I just tried your empanadas de viento recipe – delicious! The dough was super crumbly for me, though – maybe because of the altitude here in Quito? I think I will add a little vodka to the dough next time to keep it softer without making it tough. I am looking forward to trying these baked ones, too. 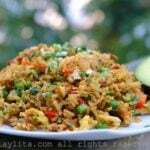 It will be great to have a little bit healthier option. Thanks for your yummy recipes.